Shrimp skewers breaded with almond flour and spices, fried in coconut oil. Served alongside salad with a rich chipotle mayo sauce. I’m not big on New Year’s Resolutions (we dedicated a whole podcast on how disruptive resolutions can be to our overall health here), but I do see the value in staying focused on the things that make me feel happy, healthy, and whole. I personally set aside time once a month (on the 10th of every month – my birthday number) to assess how I’m allocating my time, energy, and money to see if I’m actively contributing to the life I want to live. 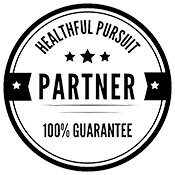 While MANY of the things I do daily to contribute to the life I want to live have nothing to do with the keto diet (think: camping, yoga, Netflix binges, pajama parties, art classes, and daily walks), there are a couple of must-do keto nutrition, diet, and keto food prep actions on my “list” that support the balanced body and mind I want to maintain with my keto diet. So the first three items are pretty self-explanatory, but the last one on quick 20-minute meals is something I know we can all benefit from. 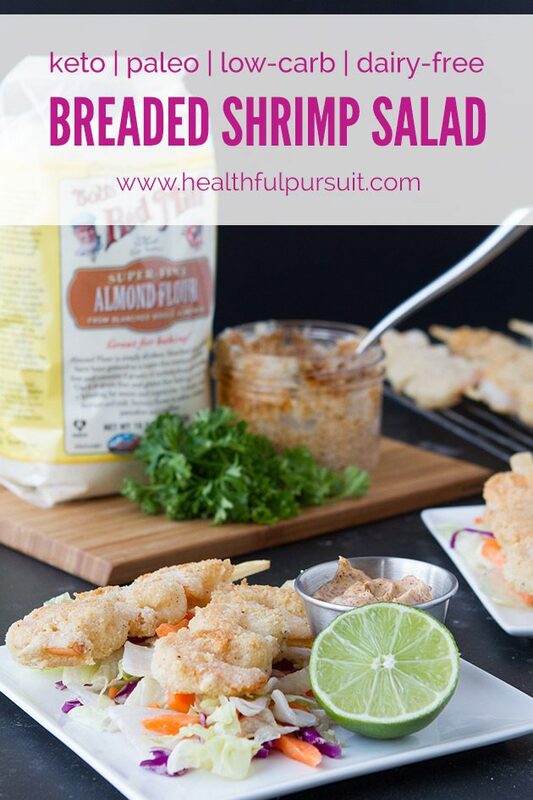 This week, I created a quick and easy keto shrimp salad that was out-of-this-world amazing. So much so that I Kevin said, “Babe, this is blog-worthy. You’ve got to make it again and share it with the peeps!” (FYI: you guys are called ‘the peeps’). So here we are! The salad couldn’t be easier to whip up. 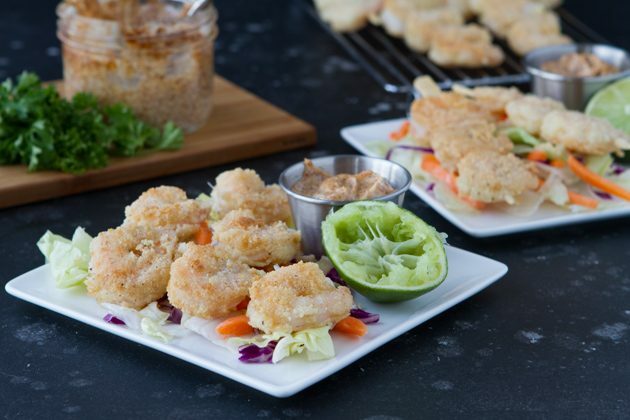 The Bob’s Red Mill Almond Flour combined with frying the skewers in coconut oil and drizzling the salad with chipotle mayo dressing makes this recipe an official FAT BOMB dinner – a great way to boost your fat for the day without relying on another silicone mold treat. Shrimp skewers breaded with almond flour and spices, fried in coconut oil. 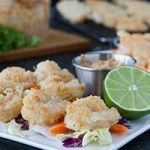 Served alongside salad with a rich chipotle mayo sauce. MACROS 85% fat, 4% carb, 11% protein. Place the coconut oil in a large frying pan. Skewer three shrimps per bamboo skewer. Place on a clean plate, and repeat until all shrimps are on a skewer. 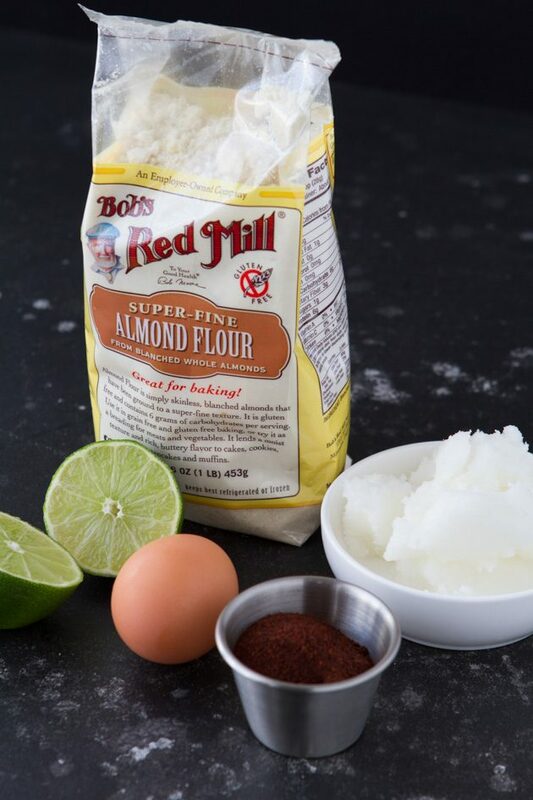 Combine the almond flour, salt, garlic powder, ginger powder, and black pepper in a shallow dish. Place the egg in a small dish. Lightly coat a shrimp skewer in the whisked egg. Transfer over to the almond flour mix and coat generously. Once complete, transfer to one side of a cooling rack. Repeat with all skewers. Set the pan with coconut oil to medium-low heat. Once the coconut oil has melted, wait one more minute before carefully placing all skewers into the oil. You may have to do batches if your pan is not large enough. Cook the skewers for up to 4 minutes on the first side. If after 4 minutes, the coating isn’t a light golden, turn the heat up to medium. Flip over and cook for another 2 to 3 minutes. Transfer the completed skewers to the opposite end of the cooling rack. While the shrimps are cooking, prepare the dressing by combining all ingredients in a small bowl. Divide the iceberg lettuce mix between four salad plates. Top with cooked shrimp skewers and chipotle mayo dressing. Leftovers, store ingredients separately, for up to 2 days in the fridge. What helps you stay motivated and inspired to treat your body with kindness? Let’s chat about it in the comments!